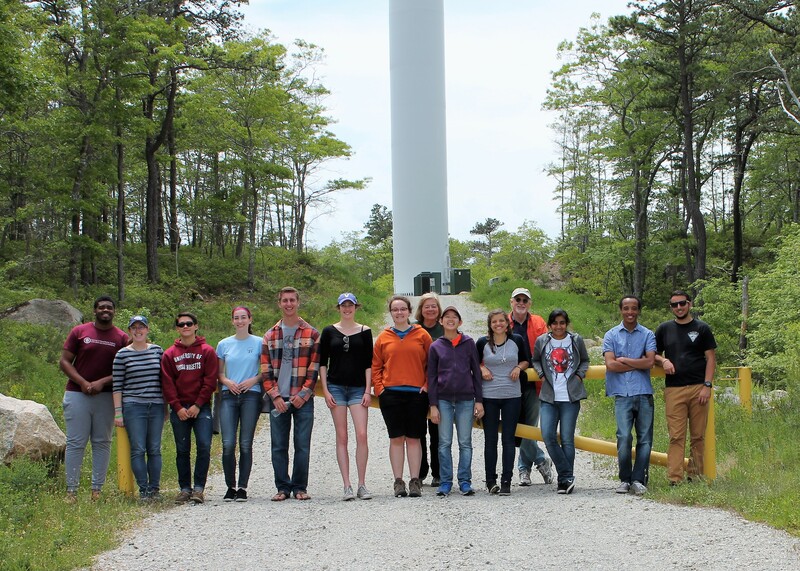 The UMass Wind Energy REU students were able to spend three days on Cape Cod exploring the wind industry in Massachusetts. The morning of the first day consisted of a boat tour of the New Bedford Marine Commerce Terminal that was recently upgraded to support the up-and-coming offshore wind industry. The students discussed the upgrades and the offshore wind industry with the Port of New Bedford staff. Following the boat tour given by the staff of the Port of New Bedford, the students explored the New Bedford Whaling Museum where they learned about the history of whaling which was a huge industry for the eastern coast. The final stop on the first day was to Massachusetts Maritime Academy which is home to the second installed wind turbine in Massachusetts. The 660kW Vestas wind turbine produces a significant amount of energy that the campus uses on a daily basis. The students were allowed to look inside the base of the wind turbine and ask questions to the Environmental Health and Safety Officer. After visiting the wind turbine, the students toured a LEED Platinum building that is also housed on the Massachusetts Maritime Academy campus. The second day consisted of a trip to the Cape Cod National Seashore and the Visitor’s center there. The students discussed potential graduate careers while sitting on a beach looking for seals in the ocean. Following this stop, the students went out to the Monomoy National Wildlife Refuge Visitor’s Center to learn about the tern colony that is located on Monomoy Island. The students then took a boat out to Monomoy Island with some of the staff from the refuge and walked through the tern colony. While there, the students learned about proper tagging and identification of each bird and some birds that are nearing extinction. Tagging the birds allows agencies to identify where the terns migrate to and if they return to nest. It was nesting season at the time and the students saw several nests full of eggs and several tern chicks. The third day began with a trip to Joint Base Cape Cod where the Remediation Program Coordinator showed us a 1.5MW Fuhrlander wind turbine that helps provide energy to waste water treatment and filtration. The students were allowed to enter the base of the wind turbine to see the different internal set-up of this wind turbine compared to the Mass Maritime wind turbine. In addition, the students were shown a groundwater treatment facility that utilizes carbon filters to remove hazardous plumes from the water table. The facility manager also explained that the base has recently been instructed by the Environmental Protection Agency to address new types of contaminants, called perfluorinated chemicals. As of right now, the facility is still using the same carbon filters to treat these types of chemicals. After a lunch at the Coast Guard Galley, the students were able to view a General Electric 1.5MW wind turbine also on the military base which has a total of five wind turbines. The final stop of the trip was out to Falmouth to see the 1.5MW Vestas wind turbines located by a wastewater treatment facility. These wind turbines are quite controversial due to neighbor complaints of noise and aesthetics. Overall, the students were able to see three different manufactured wind turbines and learn about the social impact, environmental impact, siting and permitting processes of wind farms.